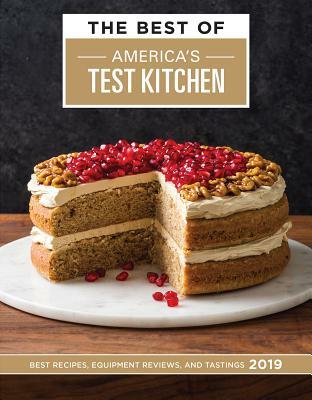 America's Test Kitchen, 9781945256530, 328pp. The best of the best--including recipes, tastings, and testings--of 2019, all compiled into one must-have collection from America's most trusted kitchen. A carefully curated collection--in full color for the first time--of ATK's best recipes of the year, selected from the hundreds of recipes developed for Cook's Illustrated and Cook's Country magazines and for new books such as The Complete Make-Ahead Cookbook, The Complete Slow Cooker, Nutritious Delicious, How to Roast Everything, Just Add Sauce, The Perfect Cake, and Multicooker Perfection. This year's edition offers a wide array of fresh, foolproof recipes like Chinese Pork Dumplings, Shrimp Po' Boys, Braised Brisket with Pomegranate, Cumin, and Cilantro, Thai Grilled Cornish Hens with Chili Dipping Sauce, and Roasted Lobster Tails. And we didn't forget about dessert! From Easy Holiday Sugar Cookies and Lazy Strawberry Sonker to Coconut Cream Pie and Blackberry-Mascarpone Lemon Cake, this collection will satisfy every sweet tooth. All of this year's ingredient and equipment tastings and testings are here, too. Want to find out which high-end blender makes the grade? Wonder how we selected our top supermarket turkey? Curious to know which roll of paper towels really gets the job done? For the answers to these questions and more, look no further than The Best of America's Test Kitchen 2019.